What is the audit and what does it do? The Technician Skills, Roles and Responsibilities Audit is a comprehensive workforce planning tool, designed to help HEIs capture the relevant management information needed to support workforce-planning. It is designed to enable each HEI to capture intelligence that allows them to understand their technical workforce. 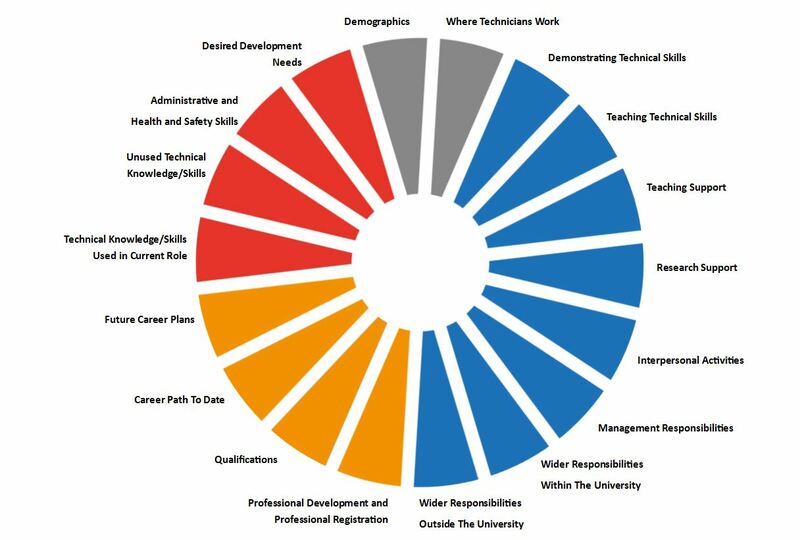 It covers the range of roles and responsibilities commonly found among technicians within HEIs, and utilises a web-based survey which includes over 2000 technical skills covering the spectrum of HE technical roles. It includes key demographic questions, including staff location, to support analysis. It can also capture development needs. The survey includes the following question areas. Hover over the cross on a segment for expanded information. Are they demonstrating technical skills to others? Who are they demonstrating to and what training have they received? Are they teaching technical skills to others? Who are they teaching to and what training have they received? Developed and tested to allow the navigation required to manage the levels of information contained within. The audit is designed to support both organisational development at an HEI, Faculty or School and Facility or Group level, and individual development. How should this tool be used? The following sections provide more information about the audit and how we recommend it would be used. If you are interested in using the tool please contact tdm@sheffield.ac.uk to arrange to discuss this further. The audit is designed to support HEIs with their strategic workforce planning, whilst at the same time providing a structure and a set of questions which support a more consistent sector-wide approach. As technical services differ between (and within) institutions in terms of the way they are organised, managed and academic disciplines they cover, an ‘off-the-shelf’ tool would be too general to be useful to meet local needs. It is important that HEIs have a tool that can work effectively within their institution and can stimulate service and staff development. The audit has been developed with 4 partner institutions and therefore reflects the variations between these institutions. The audit’s database provides access to key questions allowing HEIs to find out more about their technical workforce. This data provides answers that previously cannot be easily or accurately obtained from other internal sources. To work effectively, successful planning and implementation requires collaboration between the key stakeholders to achieve a common agreed purpose. This also requires commitment from senior academic service managers, operational managers & technical managers. Importantly, experience tells us that if the relationship between the university and the technical community is poor, then this needs to be addressed through a new approach to working together. Experience gained from working with partner HEIs demonstrated that effective change can only take place and be embedded when technicians themselves are taking an active role in driving the process forward. Change will be more effective if developed and implemented in collaboration and partnership with those who are to be surveyed; simply running a survey will not be seen as addressing the issues and is likely to result in the failures that many change initiatives suffer. The following diagram highlights in more detail how we envisage the survey being used and run as part of workforce planning. Our narrative guidance provides key information at each stage, which includes questions to consider and practical recommendations that support best practice, as well as templates and communication and engagement guidelines. Clear communication is a vital part of the process at every stage. The following information provides a guidance summary. If you want further information or wish to consider running the survey please contact tdm@sheffield.ac.uk. Setting a clear / transparent purpose for the tool: What, Why and Who? 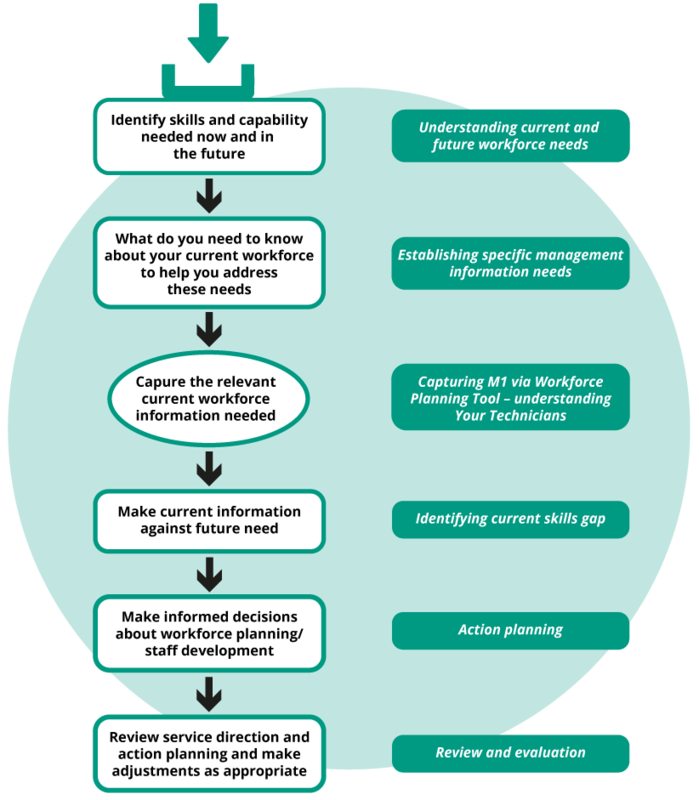 If you are considering using this tool to support workforce planning, we strongly recommend that you do this as part of a wider strategic process. To ensure that the survey is used effectively, it is important to start by making an informed decision about what you need to know – what questions you need answered. From this you can then make an informed choice about whether the survey can help you, and if so, how. This in turn will allow the survey to be tailored to meet your needs. To help you decide the information you will need to collect, the following section highlights a series of questions you may want to consider. What is driving the strategic planning activity? Why do you need to undertake workforce planning for the technical service? What factors are driving the work? What do you need to achieve? Do you know what the future service needs will be in 1 year? 2 years? 3 years? Who leads the work and who needs to be involved? Which stakeholder groups need to be directly involved in defining and agreeing the purpose? Are you clear about the target population? Is the technician population clearly defined within your organisation? What do you need to know to support the process? What information do you need to support effective workforce planning? What information is readily available? How comprehensive /accurate / up to date / accessible is this information? Alongside partnership working, we recommend transparent two-way communication about why you are using the tool. All those leading the work need to be positive, realistic and credible advocates for the process. We also recommend local champions whose responsibility is to increase awareness, communicate locally, encourage commitment, and relay user concerns. From the beginning, your communications and engagement strategy needs to be a priority. You need to have a consistent approach and clear lines of communication between yourself, key stakeholders and the technical workforce. Have clear methods of communication. How and when are your stakeholders expected to communicate with each other? Who and how should technicians contact if they have any issues or queries? Have a clear timeline of events in the run up to the survey. Everyone needs to be made aware of this so that your engagement strategy allows the technical workforce to be fully informed of what to expect and when. Have clear messages for why the survey is being run. Their needs to be a unity in the message being put out by the survey team, survey champions and technical managers. An easily accessible FAQ would be very helpful in giving everyone access to the same information. We have developed a communications package, designed to support the process of gaining commitment and engagement from key staff at all levels, and maintaining that through the survey process. This includes guidance on key messages and methods for communication (with templates), as well as a proposed timeline. Once it is clear what questions the survey needs to answer, a simple mapping exercise will identify which questions and skills need to be included or added. Whilst we have a significant database of skills, each institution will undoubtedly identify new skills. We do ask that a number of core questions remain within the survey and we will seek permission from each HEI to collect data from these questions to help refine the content and produce ongoing skills related data. The survey is complex and needs to be live- tested before being launched; sufficient time needs to be given to this. The survey will require an up to date email list for all technicians. It is essential this is accurate before the launch. As discussed earlier, effective communication and engagement activities are essential, prior to the launch, to ensure commitment and engagement from the technical community. If communication and engagement activities are effective, then staff will be sufficiently prepared for the launch and they will respond by completing the survey. They will know the purpose of the survey, how long the survey will take, when it has to be completed by, and how and when the results will be fed back. At this stage, they will also be clear about how to ask questions or ask for their link to be re-sent – this is covered in the Communications package. Distribution and ongoing survey management should be reasonably simple and includes tasks such as sending reminders to all users or selected groups, re-sending personal links to access the survey, identifying non-delivered surveys, as well as checking ongoing response rates. You will need to thank staff for their engagement and taking time to complete the survey. Where possible, you will need to keep to previously agreed timetables for reporting and action planning. If these timetables should change, people should be updated. We recommend that within two weeks individual reports are completed and sent out. As with all survey data please ensure that data storage meets the data protection requirements and your own HR data storage policies for confidential data. The survey data provides a snapshot of the technical workforce at a certain moment in time. It will have captured information about your workforce and, with knowledge of where an institution is and where it is aiming to be, given a template for things that need to be addressed. After attempting to address these issues, it will be important to run the survey again. To continue the process, the survey should be run again at a date when actions have had time to be put into place. A period of eighteen months to two years would likely be appropriate.